To celebrate a day of food, family and friends, Mohegan Sun will be offering a number of dining and retail specials this Thanksgiving on Thursday, November 28th. Mohegan Sun has a wide variety of retail and dining specials to make both your stomach and wallet thankful this Turkey Day! 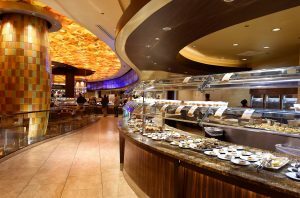 If a traditional Thanksgiving meal is what you search for, look no futher than Seasons Buffet, Todd English’s Tuscany, Bobby Flay’s Bar Americain and Ballo Italian Restaurant & Social Club at Mohegan Sun. The Big Four will be celebrating the Thanksgiving holiday in Mohegan Sun Arena. The show will have two performances on Thursday, November 25th, the first at 2:00am and the second at 2:00pm. menu items and specialty desserts. Mohegan Sun’s culinary staff is preparing an assortment of gourmet dishes this Thanksgiving. Turkey dinners, special menu items, as well as original menu items, will be served throughout the property at Mohegan Sun on Thursday, November 27th.